Well, as it turns out, I kind of nailed it early on. This quest deals with Azzanadra's attempt to contact Zaros, continuing the Mahjarrat storyline. It ties up some loose ends, particularly in regards to the Super Barriow Bros. You do that thing where the person who starts the quest isn't really the person who starts the quest, because they ask you to talk to somebody else immediately. (Ever notice how a lot of quests do that?) Mercifully, Ali the Wise/Wahisietel (hint: when you disguise yourself, don't pick a false name that's an anagram of your real name) gives you the Digsite Pendant you need to teleport to "Dr. Nabanik," who is, of course, Azzanadra, apparently a redhead--who knew? After talking with "Dr. Nabanik" and putting in a good word for him with the archaeologists, he gives you the rope you need to access the Zarosian temple (thank you) and sends you on a mission to fetch some artifacts from dangerous places. You need to get one of them from the Barrows. Surprise! We knew that the Barrows Brothers were originally cursed by a mahjarrat loyal to Zaros (probably Sliske) during the God Wars. Now we know why--they were guarding this thing while it charged up power. And apparently, the Strange Old Man is also a mahjarrat in disguise or something. Hmm. Well, we don't know who, but we know why. So you do a Barrows run as part of a quest (cool!) and then you have to go get the Frosterhorn, which is way up north in a freezing-cold place. Jeez, you'll probably need a random rope or something and have to go back to fetch it, right? Luckily, if you ask Azzanadra, he'll tell you exactly what you need: runes to cast multiple telegrabs, and an anti-dragon shield. You also need a hammer, but there's one available in the area. So you go to the deep Wilderness and visit the ancient fortress of Ghorrock, where you have to solve a puzzle where you melt ice with heat orbs. During the puzzle, by the way, you fight icefiends, which melt into waterfiends along with the ice in the puzzle--a stroke of brilliance, I think. Then you fight an ice demon and take the artifact from it. Finally, you go back and collect a delivery from--ZOMG--the assassin from Devious Minds! Turns out the artifact you inadvertently helped him steal from Entrana is one of the ones Azzanadra needs to power the communication portal. And the bowsword we've been hoping to obtain for ourselves? Well, he pretty much says, "Go to Stealing Creation and get a Sacred Clay weapon, n00b." Jerk. So finally, you get yourself a cutscene in which Zaros doesn't really return, but he makes his influence known on Runescape once more, basically saying, "THAT ****ING ZAMORAK IS ****ING DEAD MEAT." Then you get a new prayer book! Story: A good quest needs to build on the existing storyline in some way. TaS does that. Although the ending is a cliffhanger, this is probably the most significant historical event in modern-day Runescape. Wait, did I say "probably"? I meant "definitely." We're on the verge of another God Wars. It's RIGHT THERE! OH NOES! And I think we were the catalyst. Aww jeez! Gameplay: A quest needs to be fun to play, not a chore. This quest was challenging, but not because of frustration as in a quest like Underground Pass or Rat Catchers. It gives you enough clues that you don't need to backtrack all the way to the beginning because you forgot your law runes, which is not fun, but it still leaves a lot of sleuthing up to you. Good gameplay emphasizes puzzles and avoids "Do my grocery shopping please" (yeah, I'm looking at you, dwarf from MEP2). Rewards: Without decent rewards, only the storyline freaks (like me) will care about the quest at all. Lo and behold, the Ancient Curses! The long-awaited high-level prayer update! Speaking of rewards, let's talk Curses. Ancient Curses are the prayer skill's equivalent of Ancient Magicks: higher-level, higher-powered, and all about killing things. For the most part, they're better than the normal prayers. Although Piety is stronger than the Leech curses on most slayer tasks and such, draining the enemy's stats is great in PvP and amazing against bosses. Turmoil is pretty damn sweet, Wrath is far better than Retribution for settings like Soul Wars, and when you're fighting a boss as a team it's definitely more effective to drain its stats than to boost your own. The Deflection curses drain at the same rate as ordinary Protection prayers and have the same effect, only better: they prevent more damage against players, and they can occasionally reflect back to your opponent 10% of what would have been hit on you. In short, they're strong enough to provide a substantial incentive to train prayer to a very high level. Well, that was the goal, so...check. And the price of dragon bones evidently has level 95 prayer, because it just activated Turmoil. Dragon bones are rising. Fast. What's interesting is that we knew this was going to happen. Jagex announced a while back in their Q&A that new high-level prayers were on the way, and dragon bone prices spiked up to around 3.8k each in anticipation. I myself bought up a few thousand of them and trained my prayer to the high 70s. The price had already shifted partway to accommodate the new curses before they had even been released. Dragon bones are now 5.2k each and rising. I predict that dragon bones will continue to rise for no longer than a week before crashing. When they do crash, they'll overcrash, as is normal for the Grand Exchange, so the crash will be followed by another spike, smaller this time. (If you think you can predict where the market will bottom out, you could potentially earn some great profit riding the second wave, again a normal phenomenon.) 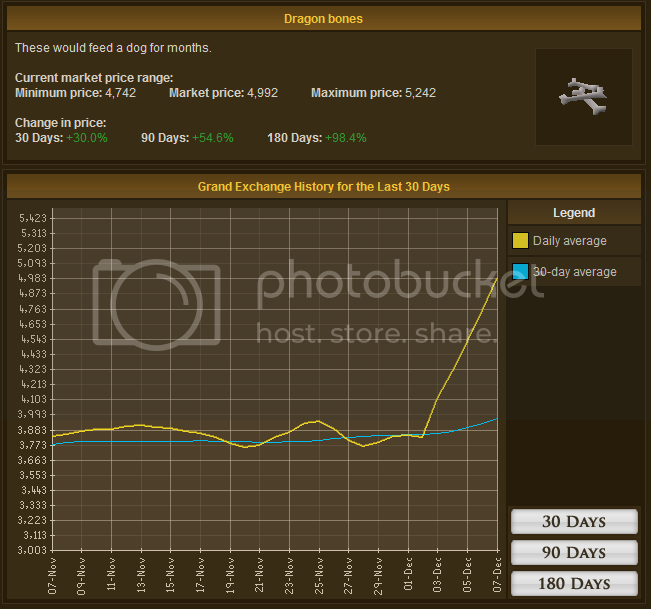 After that spike, there will be a smaller crash and dragon bones should stabilize comfortably. I'm not sure what price they'll end up. My guess is somewhere in the 4-5k range, but I could be wrong. I am certain, however, that they will not go back to 2k each unless something radically changes on the supply side. How can you profit from this? Obviously, kill green dragons. They're a huge moneymaker right now. Of course, everyone else will have thought of that too, so they'll be really crowded. If you want to dodge the crowds, consider visiting the lesser-populated of the green dragon spots: south of the Lava Maze, best-accessed via canoe; and west of the Dark Warriors' Fortress, best accessed with Ancient Teleports I suppose. That's not the only way to take advantage of the prayer boom, of course. For one, you can kill other dragons--again, obvious and everyone else will have thought of it. You can also kill baby dragons. Babydragon bones are approaching prices that have historically belonged to the bones of their mothers. Baby blue dragons could prove a decent moneymaker, especially for players with 70+ agility for the Taverley Dungeon shortcut. Big bones are rising as well, making it a good economy for killing giants and such. Moss Giants could be worthwhile for mid-level players--they're not bad for xp, and they drop herbs and herb seeds that have benefited greatly from the rise in price due to the herblore update. I'd recommend them over hill giants. Good places to fight them are the Chaos Tunnels and west of the Fishing Guild, both reasonably close to a bank. I really enjoyed doing this quest. It was fun to do, it had a lot of story, and the rewards are nice. All in all, a good update. Some bits & pieces to track this week too, although not many. Here's your list. Items sold in the shops in the Warriors' Guild have had their GE price caps adjusted. This means plain pizza is buyable again! Woot! There is now a fairy ring in the Ancient Cavern, code BJQ. You have to plant it yourself with some mushrooms and a spade, but once you do, you can access the Ancient Cavern through it. (It comes out near the western waterfiends.) A side effect of this is that you can now bring full beasts of burden to mithril dragons, which was previously impossible. Cannons now have a visual cue that indicates when they're close to degrading. Fist of Guthix rewards cost less to recharge. The interface for POH bookcases has been tweaked for better usability.